Yes, it is really an island. Our condo sleeps four.. Up to 2 adults & 2 kids. If you click on a picture, it gives you a larger view & a description of just what the picture is. We are just across a quiet two lane street from Sunset Beach on the Gulf of Mexico & are also on the Bay. We have our own private entrance to the Gulf & our quiet beach. Our second floor condo has one bedroom, living room and fully equipped kitchen. If our schedule is full we do have another condo available in the same complex same price that is designed for couples & sleeps 2. Just ask for details. There are water views from the condo. It is air conditioned and has ceiling fans. There is a king size bed in the bedroom & a queen size sleeper in the living room. NOTE: Condo rules limit the number of people in a one bedroom condo to 2 adults & 2 children. Three or Four adults are not allowed. The kitchen includes coffee maker, toaster, teapot, mixer, and lots of pans and silverware plus accessories.. The linens are all supplied. When you're not at the beach, enjoy our large solar heated pool with tiki huts, chairs for sunbathing or relaxing. Island time starts here! You'll love Treasure Island. Yes, it is really an island--you must cross causeways to get here. breathtaking sunsets, white sand beaches, and sparkling water on the Gulf of Mexico. The pelicans,dolphins and boats passing by make the spectacular views just about perfect. This is a clean, newly decorated up-to-date florida style condo as you'll see in the pictures. Every effort has been made to make you feel relaxed. It is air conditioned and has ceiling fans. Note: This is a second floor unit if the stairs would be a problem. TOTAL OF 13% will be added to your rental as LODGING STAY TAX. These are the taxes for Pinellas County & Florida State. There is also a $75 fee for cleaning added to rental fees. Vacation Rentals is also now charging a separate service fee to renters. CLICK ON THE CALENDAR TO CHECK FOR AVAILABILITY. It is up to date. We are only about 30-40 minutes from Tampa airport and even closer to St. Petersburg airport. ****TO PAY FOR YOUR RESERVATION OR RESERVE THE TIME CLICK ON THE REQUEST TO BOOK button. We have instant booking. We are a senior couple with 3 kids & seven grandchildren. We like to travel, but always enjoy coming back to Treasure Island. We fell in love with the property and purchased after our first visit. The area truly does have something for everyone. Our latest feedback "Most Relaxing Place We've Ever Stayed." It is across a quiet two lane street from the Gulf of Mexico & its white sand beaches with our own private entrance. Save big money by walking a few steps to the beach Also there is a dock, picnic tables & grills on the Bay. The sparkling pool is solar heated.& surrounded by 3 tiki huts & lots of seating. Tub with shower. Also outside shower. We are across the street from the Gulf of Mexico which is the ocean. The Gulf of Mexico is directly across from a quiet 2 lane street. We have our own private access. We have a dock & picnic on the Bay side, also. We are on the Bay with fabulous views. We have heat on the few days you may need it. In building. washers & dryers. You'll need quarters for the machines. Free assigned parking. numbered spaces. Even a place for guest parking. All dishes, silverware, pans, blender, tea pot, mixer, tupper ware bowls. Most of what you'll nned for cooking. Full size refrigerator, electric stove _& microwave. There is a dock & picnic area on the Bayside. Solar heated Pool just for condo guests. Can’t beat location or condo for the price! I’m very picky. Condo was very clean and fully stocked with more than we have ever had! We travel a lot and we had to bring nothing but clothes! Kitchen fully stocked, tv’s showed OSU game, clean pool and friendly pool guy, Mickey, located close to our favorite spot “caddy’s”....easy reservation process with owners! Close to restaurants, bars, and shopping! Weather and trip was perfect! We will be back! We try to make this a fun relaxing vacation spot. So glad you enjoyed it. Thanks for the rave review. Look forward to having you with us again. Most guests enjoy Caddy's & it is nice to have it within easy walking distance. Beach Was Wonderful but the condo was not!! The location was great, the condo was dirty, dirty, dirty. The floors in the kitchen and bathroom were dirty. Old food on the floor. The 50 year old carpet was so very dirty. Even the throw rugs were stained and dirty. The smoke smell was so bad inside. Couldn't even go sit by the pool because everyone smoked. The so called new bed had lumps. It was not brand new. Mold in the bathroom shower in many places. The so called ironing board was a small one that sits on a table with an vintage iron that wouldn't steam. We were in town for our daughters wedding and we couldn't get our clothes ironed out. We have 21 very positive reviews. People have always let us know how clean & nice our cleaning ladies ladies keep the condo. We can't believe it was anything less than clean. The other renters were very happy with the condo. It is a clean air non smoking condo & no one should have smoked in there. The two things I can address. I will get a new iron & the rug is scheduled for cleaning in September. I would definitely recommend to anyone. The unit has everything you need. Such a relaxing and fantastic time. Thank you for your glowing review. W try very hard to make it a dream vacation for our renters. Amazing Vacation. I Can’t Say Enough Positive Things! Fabulous condo right by the ocean!!! You can see the ocean from the balcony. The beach is clean, beautiful, and not crowded. Homeowners provide all the things you need for the beach. This is great when you are traveling with minimal luggage on Allegiant. Very safe and quiet area. I am a single mother with a teenager and an elementary school kid. Never had any safety worries. House is fully stocked with everything you need. Homeowners are kind, courteous, and willing to answer all your questions. Condo is right in the heart of everything. We kept food costs down by being able to cook at the condo. All the appliances are new and work great. The condo also has fast WiFi, a must for all kids. Condo is clean, safe, and nicely decorated. You won’t go wrong booking it. Thank you Justine for your rave review. We try to make this a dream vacation spot. Reviews like yours tell us we are succeeding. We just returned from a one week stay and I must admit, everything was above my expectations. Clean and cozy condo with tons of little extras (from kitchen utensils, Tupperware to beach chairs, umbrellas, & rafts). 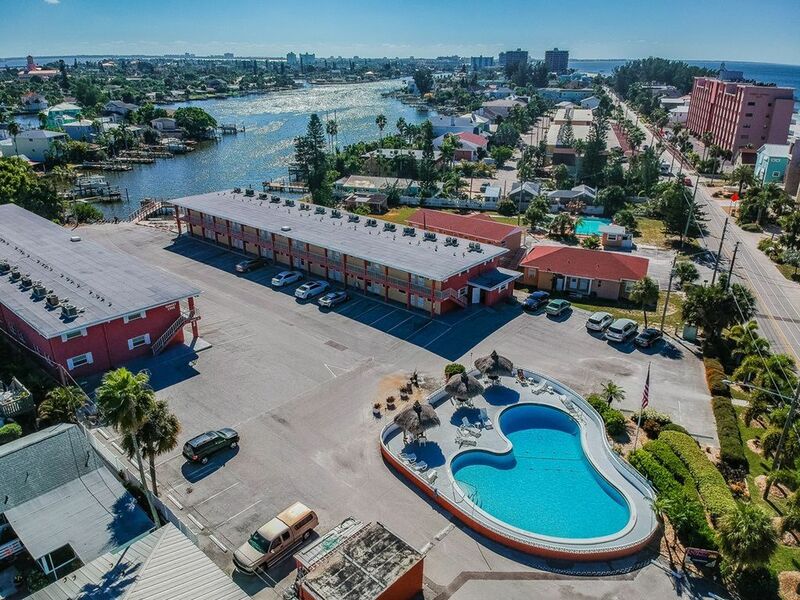 Great location for walking to the beach, beach bars or gas station. Just a short drive to tons of stores and shopping. Great restaurants just a few miles away. You will not be disappointed with all this rental has to offer. So happy everything was above your expectations. We work hard to make it a happy place. It's nice to hear so many good things from our guests & hear it is perfect. Nice place quiet location and convient to everything. and malls within a few minutes drive. right in the town of Treasure Island. Disney World and Universal Studios are about 90 minutes away. Several golf courses are nearby. Golf year round. Visit Busch Gardens, The Pier, Mosi, and art museums. Also Ruth Eckerd Hall and five smaller community theaters & the famous Chihuly Glass Art Museum. St. Petersburg is just across the causeway with art museums, theaters, and other big city venues. John's Pass Boardwalk is at the other end of town with restaurants, pirate ship rides & shops. There are just too many activities and attractions to list them all. Kick back and live on Island Time. Your reservation is not confirmed until we receive your deposit. Often times we receive multiple requests. These rates are good for up to 2 adults & 2 children. There is a charge for more than 2 adults.